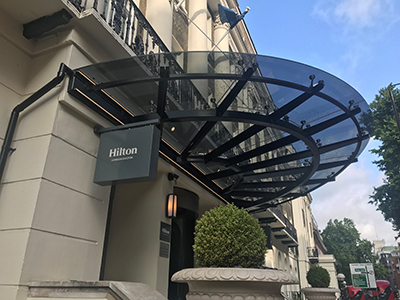 UMG have recently installed a stunning new entrance canopy for the Hilton Hotel, Euston, as part of an extensive refurbishment during 2017. 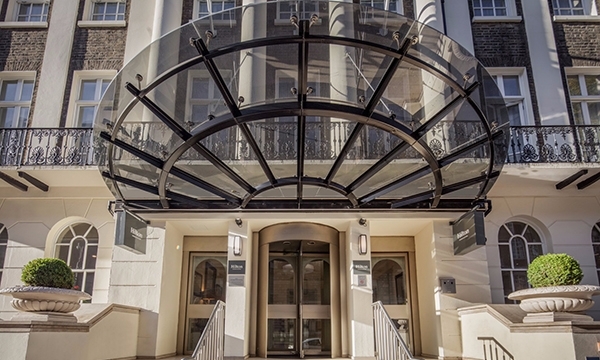 The design of the new canopy provided a more modern look to the entrance and this presented a brighter feel at the same time offering a high-quality image to welcome customers and guests entering the hotel. The concept for the changes were submitted to the client for approval, by Morrison Architects of Derby. UMG were appointed to develop the concept into a design solution. Taking into account the need for minimal structural changes to the fabric of the building entrance, the rear structural steel beam from the original canopy was utilized to support the new structure. After the removal of the old canopy, UMG designed and fitted first-fix connection brackets that were welded on to the original beam, ready to receive the new canopy frame. UMG developed the design of the frame as a fully welded one-piece structure using rolled steel sections and radial support arms. This gave the canopy a much neater appearance without the need for bolted cleats and brackets. Whilst in the workshop, the completed frame was measured for the shaped glass needed, to accurately match the shape of the frame. The glass used was 17.5mm toughened laminated panels, made up of a 10mm grey tinted panel bonded to a 6mm clear panel. Without using both panels tinted meant that the laminated panel allows through some natural light. The canopy was installed with a 3° pitch, so the rainwater can be drained towards a concealed gutter at the rear. The main benefit of the canopy frame being in one-piece, meant less time was needed on-site assembling the frame during installation. When UMG arrived on-site all that was required was to lift the canopy into position and bolt it to the frame and the previously fitted brackets. The structure was in place on day one of site activity, and the glass was lifted onto the frame and secured, meaning the installation of the canopy only took 4 days. UMG have been involved in the design and construction of commercial glass canopies for over 20 years, and during this period they have gained a wealth of knowledge and experience. UMG work closely with their clients to develop detailed designs, specifying all the materials required to meet the needs architecturally, structurally and within a budget. Morrison Design had nominated UMG for this, and other similar projects because of their unique understanding within the industry.